Allan Stanley was widely considered to be slow afoot—on skates. I have vivid memories of watching Stanley in his Leaf years, which began early in the 1958-’59 season. That coincided with the beginning of the Leaf turnaround, after several seasons in the hockey wilderness. Earlier that year, Punch Imlach had joined the organization into a management capacity. Veteran minor-league goalie Johnny Bower came on board, as did ex-Montreal winger Bert Olmstead. The team culture started to change, and Stanley was a big part of it. Interestingly, Stanley had a full career before he ever hit Toronto. He spent several years in the minor from the mid-1940s on, and then played six seasons on Broadway with the Rangers, then two each in Chicago and Boston. He was traded to the Leafs for another defenseman, Jimmy Morrison, at the outset of the 1958-’59 season. 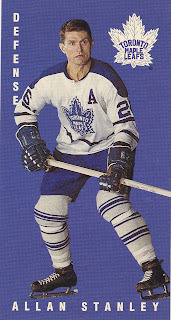 He spent the next ten seasons in Toronto, and of course, he was instrumental in the 4 Cups the Leafs earned in the '60s. Now, if you were around back then, you no doubt saw Stanley. He was a tall rearguard and used his long arms to advantage. While indeed somewhat "slow", he read plays well and teamed well with the more offensive Tim Horton. Horton was also more rugged, more of a hitter, though Stanley could hand outs checks, too. They complemented each other in the defensive zone, and had some wonderful years together. When I watch old games now, it verifies my memory of the kind of player Stanley was. While hardly fleet afoot, he was one of those guys who still got where he needed to go. He seemed to be able to skate as fast to do what he had to. He was good enough to play almost 1,250 regular-season NHL games and more than a hundred in the playoffs. That said, his teammates called him “snowshoes”, a comment on his skating style. He was one of the real gentlemen in the game, and finished his career with the expansion Flyers in 1968-'69. He was rightly elected to the Hall of Fame in 1981.